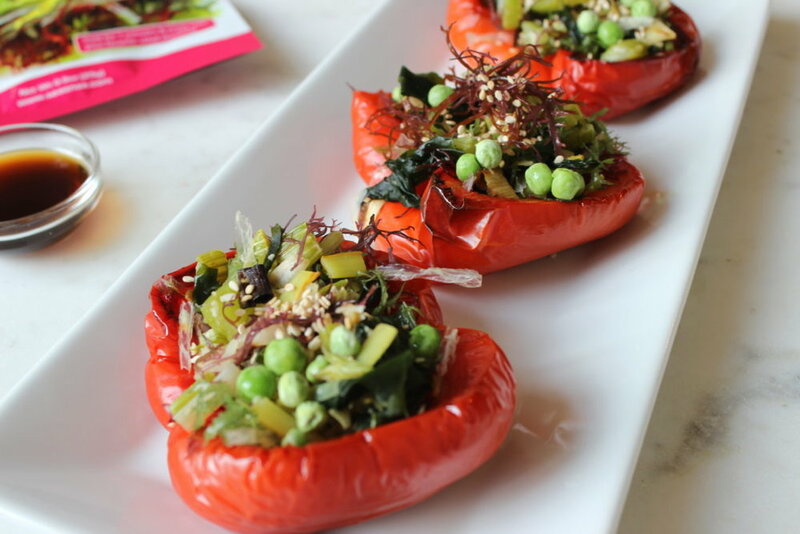 Seaweed Salad in Roasted Bell Pepper Boats — Indulge in your health. Seaweed salads are traditionally served in little bowls with chopsticks, but this Sea Vegetable salad is served in a simply roasted edible bell pepper boat— taking the concept of “stuffed peppers” to the next level with an Asian twist. I love this concept because if you are entertaining, guests can grab a pepper, instead of having to scoop seaweed onto their plate, plus it adds beautiful color to an other dark dish. Serve with a variety of sushi rolls, kimchi and rice, for an Asian inspired evening. It’s so easy to make, and what I really love about the ingredients is that they are not only packed with flavor, but I avoided using the traditional soy, gluten, sugar, and low quality oils that are more traditionally used. Preheat oven to 425 degrees. Line a baking sheet with foil, or cooking spray, and lay out 3 bell pepper halves, open facing. On another baking sheet, lined with foil, or cooking spray, spread out leek and celery, then lightly sprinkle with sea salt. Bake peppers for 25 minutes, on the middle/top rack, flipping over and continuing to bake for a remaining 5 minutes. Bake leek and celery on bottom rack for 18-20 minutes, or until leek and celery are just barely browning at the edges. In a small mixing bowl, whisk together coconut aminos, garlic, horseradish, sesame oil and sesame seeds, then toss in seaweed. Combine well. Add peas, baked leeks, and celery and set aside. When peppers are finished baking, you may wish to allow them to cool and peel their skin off, or leave it. Plate peppers and distribute seaweed mixture into each of the peppers. Serve with chop sticks, and enjoy seaweed right out of the pepper boat, or enjoy with a fork and knife, slicing into the bell pepper. **Save other half of hydrated SeaVegi salad in a sealed container in the fridge for 2 days. **Save remaining half of red bell pepper for future recipes. What the hemp? A new series about the benefits of hemp and cbd.